Fireside chat with Dr. Agnes Binagwaho, Vice Chancellor of the University of Global Health Equity and former Minister of Health of Rwanda on "The Role of Educational Institutions in Creating Social Change"
Dr. Agnes Binagwaho is currently featured on Bill Gates's blog as part of a series on innovators in global health here: https://www.gatesnotes.com/Health/Heroes-in-the-Field-Dr-Agnes-Binagwaho. In addition to profiling Dr. Agnes' impressive impact on the Rwandan health sector, Bill Gates expresses his excitement about the University of Global Health Equity. 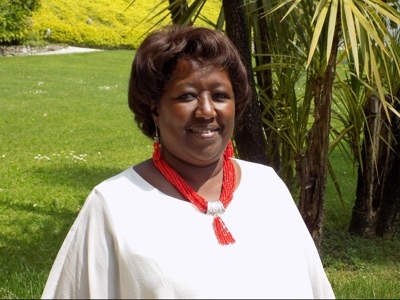 Dr. Binagwaho was named Vice Chancellor of the Partners In Health initiative, the University of Global Health Equity, in 2017. From 2002-2016, she served the Rwandan Health Sector in high-level government positions, first as the Executive Secretary of Rwanda's National AIDS Control Commission, then as Permanent Secretary of the Ministry of Health, and then during 5 years as the Minister of Health. She is a Senior Lecturer in the Department of Global Health and Social Medicine at Harvard Medical School, a Professor of the Practice of Global Health Delivery at the University of Global Health Equity in Rwanda, and an Adjunct Clinical Professor of Pediatrics at the Geisel School of Medicine at Dartmouth. She has held an array of leadership and advisory positions on national and international scale. She has been a member of the American National Academy of Medicine since 2016, and in 2017 she became a fellow of the African Academy of Sciences. Presently, she serves on: the African Advisory Board of the Steven Lewis Foundation; the Advisory Board of the Friends of the Global Fund Africa; and the Advisory Committee of the International AIDS Vaccine Initiative; the Global Task Force on Expanded Access to Cancer Care and Control in Developing Countries; the Global Health Innovative Task Force; several editorial boards of the scientific journals; the International Strategic Advisory Board for the Institute of Global Health Innovation at Imperial College London; the Advisory Committee Member of the Disease Control Priorities 3 (DCP3); and multiple Lancet Commissions, including the Lancet-O'Neill Institute Georgetown University Commission on Global Health and Law, the Harvard Global Equity Initiative - Lancet Commission on Global Access to Pain Control and Palliative Care, the Lancet Commission for the Future of Health in Sub-Saharan Africa, the Lancet Diabetes & Endocrinology Commission, and the Lancet NCDI Poverty Commission: Reframing NCDs and Injuries of the Poorest Billion. In 2015, She received the annual Roux Prize and Ronald McDonald House Charities Award of Excellence. With over 150 peer-reviewed publications, her academic engagements include research across areas including health equity, HIV/AIDS, information and communication technologies (ICT) in e-health, and pediatric care delivery systems.